Kolkata, February 4: In the latest faceoff between the Kolkata Police and CBI, West Bengal Chief Minister Mamata Banerjee has paced a stage in Kolkata with all the drama this morning after spending a wakeful night without food in a huge showdown with the central government over an investigation for which CBI officers wanted to question the city police chief. With the elections just a few months away, the opposition parties are showing how low they can stoop to be in power. 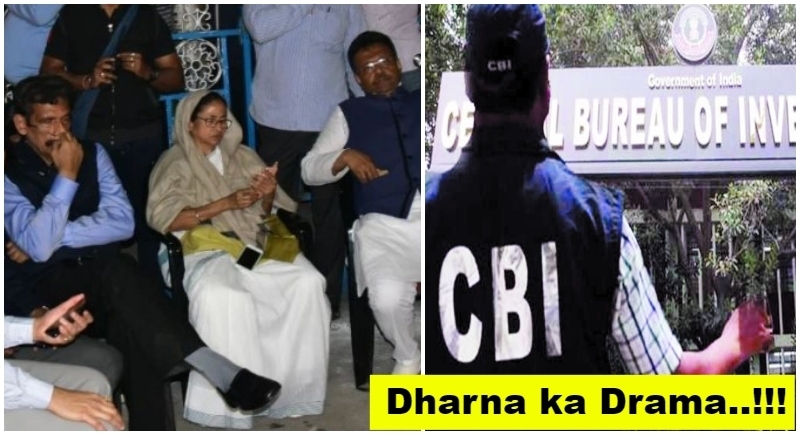 The Chief Minister called this dharna as ‘Satyagraha’ but the irony is the person who is trying to ‘malign the basic fundamentals of constitution’ is sitting on dharna to ‘save the constitution.’ The CBI had been to the Kolkata Police Commissioner Rajeev Kumar’s house to question him over missing documents linked to an investigation into two Ponzi schemes over which several members of Mamata Banerjee's ruling Trinamool Congress have been jailed. Rajeev Kumar headed a Special Investigation Team probing the Saradha and Rose Valley chit fund scams of 2013. Chief Minister Mamata Banerjee dared the centre to place Bengal under President's Rule and called the CBI's attempt to doorstep the police chief a "total constitutional breakdown". Covering up her scams and trying to save her collar from being exposed the Chief Minister blamed the centre for CBI’s investigation. The CBI today told the Supreme Court that the Kolkata police chief is a "potential accused" in the investigation into the chit fund scams in Bengal, accusing the city police of destruction of electronic evidence. The Supreme Court asked the investigating agency to produce evidence to support its allegations; it will take up the petition tomorrow. Over the past few weeks, the Chief Minister has blocked attempts by the BJP to take out roadshows and even denied permission to top leaders to land their choppers at rally sites. Continuing her banter and fear, Mamata Banerjee did not allow Yogi Adityanath’s chopper to land in Kolkata for a rally and the Uttar Pradesh Chief Minister had to give his speech remotely via phone. The Prime Minister had said the Bengal government was killing the aspirations of the middle class through "Triple T - Trinamool Tolabazi Tax". 'Tolabazi'' roughly translates to an act of organised extortion. The government is bringing back the black money and the corrupt faces because of which Mamata Banerjee is petrified of the CBI investigation.